Bernie Gandy, Jr. founded Gandy Printers in 1970 with a strong sense of duty and the value of a job well done. Today Gandy Printers still upholds those same ideals. At every level of production, your order is treated with care and carefully monitored for quality and consistency. Family Owned And Operated. Gandy Printers. A premier, family owned and operated print and marketing provider. Founded by Bernie Gandy Jr. in 1970, Gandy Printers has been bringing expertise, passion and sincerity to the Tallahassee community for over 40 years.There are more printing options today than ever before. Gandy Printers gives you the attention and reliability of a mom-and-pop shop with the skill and proficiency of a giant printing company. Our team is dedicated to continuing the ideals of our founder, Bernie Gandy Jr.
Did You Know? 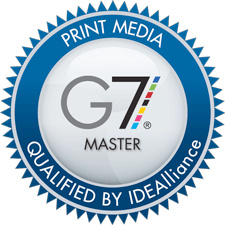 Gandy Printers is the Areas Only G7 Certified Print Shop? CLICK HERE TO FIND OUT MORE ABOUT G7 CERTIFICATIONS. Offset printing is the “traditional” method of printing. It was the only form of printing available in local shops when Gandy Printers of Tallahassee, FL was founded. It has remained our core business over the past forty years. Digital Printing at Gandy Printers is among the highest quality results you can achieve. Before including it among our services, we waited until digital printing technology was comparable to the results of Offset Printing. Wide format printing is produced on large inkjet printers.This method is ideal for producing banners, short runs of large posters, window graphics and clings, point-of-purchase displays and outdoor pieces that need to withstand the elements.